Feeling helpless and trapped with your existing proprietary platform and applications? Held ransom by costly software upgrades? Open source innovation is not a fad. It is here to stay. Enterprises around the world have migrated to Linux because they used to be as frustrated as you. Things happen for a reason. Especially good things. Isnâ€™t it time you make them happen? The revolution of choice continues. 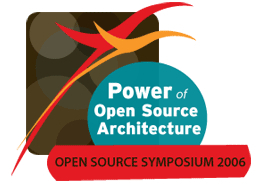 Come August, Red Hat will kick off a series of open source symposiums across 14 cities in Asia Pacific. Rediscover choice in mission critical enterprise computing face-to-face with Linux communities, including developers and users, customers and industry watchers. This is where your doubts and the myths about open source will be debunked. Spend a day with us and youâ€™ll see. Developers: Do note that there's a session for you. The registration is free for the first 50. So, be first to register! Besides Kuala Lumpur, the event will also be held at other cities: Beijing, Seoul, Shanghai, Taipei, Guangzhou, Bangkok, Manila, Mumbai, Bangalore, Singapore, Sydney, Melbourne and Auckland. Get more details from the official website of Open Source Symposium 2006. Going or not? Organise we go together-gether. Duuuude… I really like your blog. Don’t be surprised if you see me around here more often… BOOKMARKED! I’m not sure. I can hardly get the people here moving since it’s on working days. I’ll mail you to talk about it after I finish my current task, which is due tomorrow. Thanks. Hope you enjoy it as much as I maintain it.